Try Continuous Ink System with your Brother DCP-J925DW and make 30 times more quality prints for the same money! Pay only 0.04 USD for A-4 full color print! Installation of the CISS Brother DCP-J925DW will let the User save a sufficient share of his money to be spent for color inkjet printing. 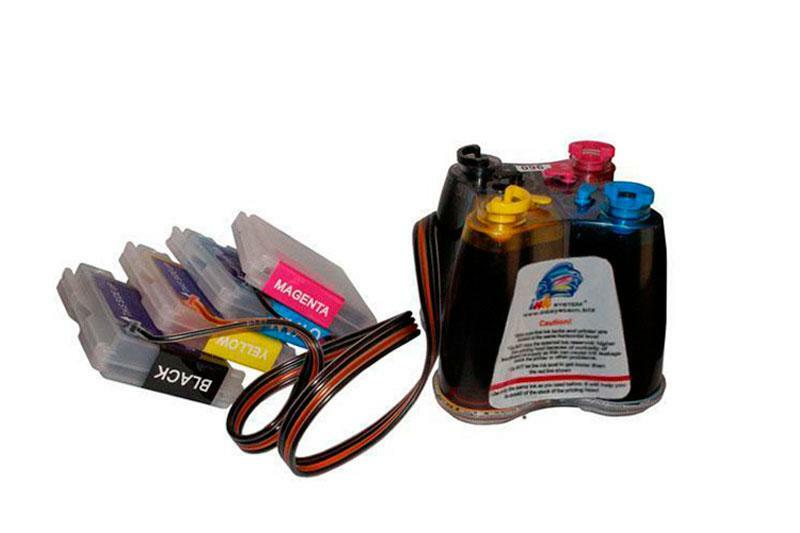 The device comprises special external ink donor tanks interconnected with original printer cartridges with the help of thin silicone tubes, which together form a multi-channel cable. Through the cable color inks are fed to the cartridges and further to the print head. The CISS DCP-J925DW continuous ink supply helps to decrease your printing expenses by at least 30 times as compared with standard cartridge operation. The CIS Brother DCP-J925DW Can Realize Dreams. Its donor tank capacity from 10 to 20 times exceed the capacity of standard replaceable cartridges. This lets the User print more than 3000 10 x 15 cm photos without ink refill. Self cost of a 10 x 15 cm photo printed at home with the system help is from 20 to 25 times lower than that printed at a professional laboratory. In order to refill inks, there is no need to remove the cartridge from the printer, that is why the ambient air can not get inside the print head, and therewith the print head duty cycle gets longer. And as far as you remember, the PH is the most expensive part of your printing device. One CISS Brother DCP-J925DW Ink System together with the kit of color inks is cheaper than one standard set of original cartridges. With the system you will get the possibility to refill each ink color separately according to its real consumption. Easy operation of such device as an inkjet printer in combination with its high printing rate and perfect print quality, including photo prints, makes this device ideal for everyday use in office, at home or in a little home office. What Are the Requirements for the CISS Operation? It is more reasonable to apply the CISS for DCP-J925DW continuous ink supply system to those inkjet printing devices, which use fixed ink heads. (As opposed to them, there exist printers without their own print head, but they use print heads supplied as a part of their disposable cartridges). The same condition is valid as well for similar representatives of this class models CISS for Brother MFC-990CW and CISS for Brother MFC-J220. This depends on the longer duty cycle of built-in print heads, although it is still possible to install the CISS for Brother DCP-J925DW system onto a printer with a disposable print head mounted to its cartridge. The cartridges are equipper with permanent recoverable auto-chips.